AUTEUR ARIEL: bareSkin: Shake, Drop, Buff. As some of you know, I'm a huge fan of bareMinerals! It's the only brand of foundation I've found that really works for my face. So when bareMinerals asked me to partner up with them to try out their new bareSkin Pure Brightening Serum Foundation, I couldn't resist! bareSkin was created with "purity" in mind. It's a liquid foundation that has no oil, no silicone, no water, no parabens, and no fragrance. It's powered by Lilac Plant Stem Cells, Vitamin C, and mineral sunscreen (SPF 20) to target past, present, and future skin imperfections. Meaning, it's actually healthy for your skin! In fact, based on a clinical study, 100% of women experienced more even-toned skin immediately after application and 95% of women experienced a measurable improvement in the appearance of dark spots. 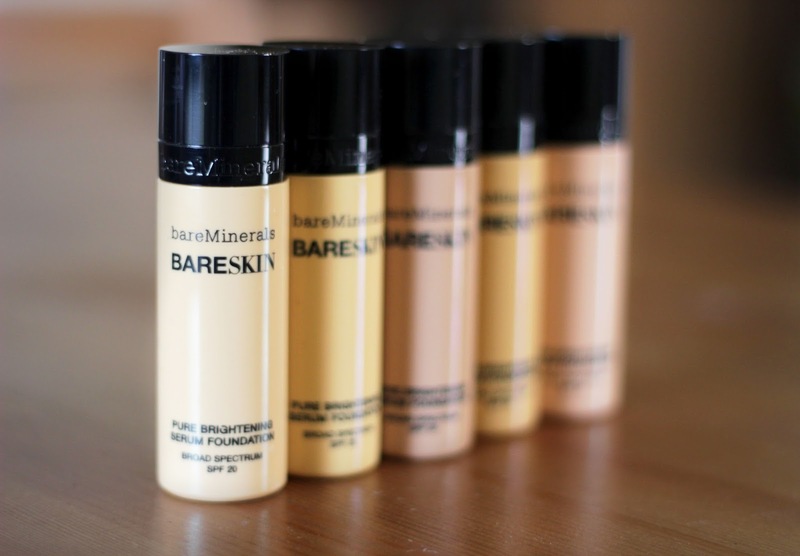 bareSkin comes in 20 skin-loving shades and their sleek, shade-matched bottles make it easy to find your perfect match. The thing I love most about this foundation (besides its good-for-you formula) is how easy it is to apply! They've even got a new Perfecting Face Brush--specifically designed for use with bareSkin--to make the process of applying foundation easy as Shake, Drop, and Buff! Shake the bottle well for a perfect mix of ingredients. Drop 1-2 drops of foundation into the brush reservoir. Buff the foundation onto your skin in circular motions. bareSkin lives up to its name--the results after application is a no-makeup look and feel. My husband doesn't really like it when he can tell that I'm wearing foundation, and neither do I. Nothing is worse than looking in the mirror halfway through the day and seeing your foundation highlight every wrinkle and blemish on your face. Isn't foundation supposed to cover those things up? Well, bareSkin hides all those things while making it look like you've got nothing on your face! I'm wearing bareSkin in the picture below and I'm really loving the results! So give bareSkin a try! 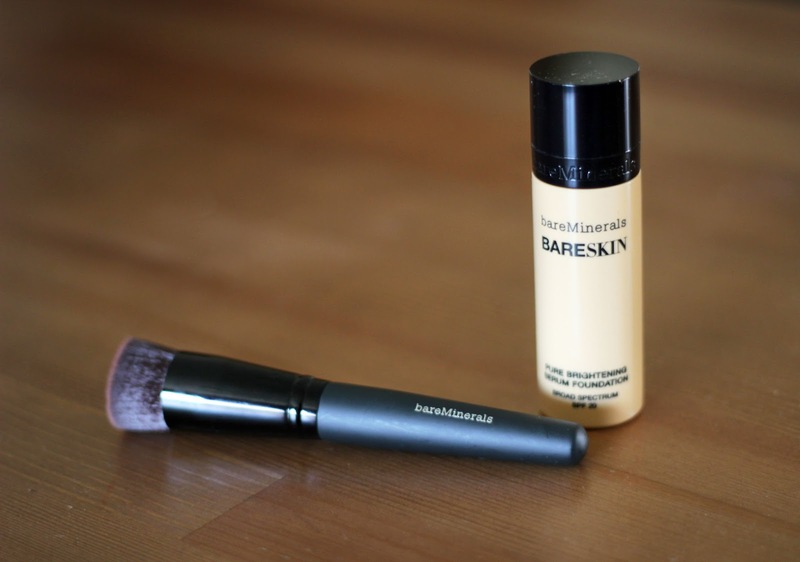 Thanks to bareSkin for sponsoring today's post! I LOVE bareminerals! Im going to have to look into this one! Beautiful! I like mineral powder foundations for at-home days but I prefer a more full coverage look for being out and about. This looks like a perfect combination, and reducing dark spots is even better. Thanks for the review! BareMinerals is all I wear. I have been wanting to try the liquid foundation, but I love the powder too much. I used to wear BareMinerals and was so excited to see they released a liquid! Your skin looks gorgeous! I have this on my list! I'm so excited to try it out. :) How much of a difference do you think the brush makes? Like, I have a buffing brush that I use for my liquid foundation now that I really love--do you think using this brush is totally necessary? Thanks so much for sharing! 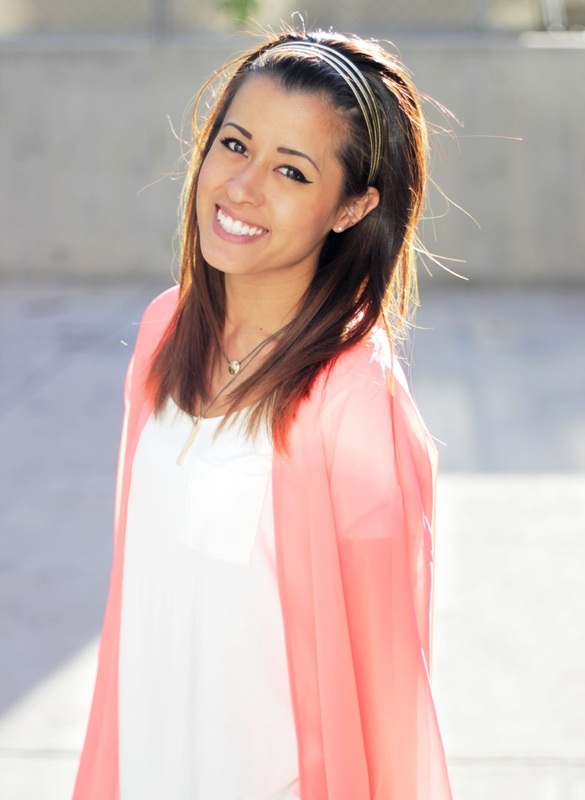 I use bare minerals and I am intrigued by the liquid... Looks amazing on you! Thanks for sharing! I have wondered about this foundation and will have to try it. Stopping by from Funday Monday! I'm super intrigued by this product. I love bareMinerals! Thanks for the review.